Tank How Long Does Propane Last? Whether you rely on propane to heat your home or power your barbecue, having enough fuel on hand is essential to avoiding the expense and inconvenience of running out. Fortunately, the shelf life of propane gas is practically indefinite, so long as your fuel is stored properly and securely in a well-maintained tank. In this article, we’ll look at some of the factors affecting propane gas lifespan, as well as some tips for keeping your fuel tank in excellent condition. Propane is a fossil fuel created as a byproduct of natural gas and petroleum refining. Under normal conditions, it is a colorless, odorless gas, though for commercial storage and transport it is compressed to a liquid form, with special odorants added for safety’s sake. Propane is used most commonly in gas barbecues and stoves. A smaller number of homes rely on propane for powering furnaces and water heaters. It is also used in campers and RVs to provide heat and drive certain appliances. How Long Does a Barbecue Propane Tank Last? Since it is one of the most common applications, we’ll look at barbecue propane first. Most of us who grill regularly know the frustration of running out of fuel in the middle of cooking something. Since many grills don’t have reliable fuel gauges, knowing how long a propane tank will last is critical. Most gas grills use standard 20-pound propane tanks. On a mid-size barbecue, one tank can usually be counted on to provide between 18-20 hours of grilling time. Larger grills, on the other hand, may burn through a single tank in as little as 10 hours. While there are complex formulas for estimating how much fuel you have left, it’s usually easier to play it by ear. As you become more familiar with how your grill performs, you will likely be able to sense when it is running low. How Much Fuel Does a Propane Furnace Need? First, look up the BTUH rating of your furnace. A gallon of propane contains 95,000 BTU. Divide that by the BTUH rating of your furnace to determine how long a gallon of fuel will allow it to run for at full capacity. Determine the capacity of your tank. A typical 40-pound portable tank can store up to 9.5 gallons of actual fuel. Multiply propane burn rate by capacity to find out how long you can expect a single tank to last. Large stationary propane tanks must be recertified 10 years after their date of manufacture and every five years following that. A propane delivery company can refuse to fill your tank if it is not certified or if it is rusted or in poor condition. To keep a propane tank in good condition for longer, regular preventive maintenance is a must. This can include a visual inspection of the tank as well as leak testing, fuel quality monitoring and more. For more information, contact a Foster Fuels representative today. We go to great lengths to ensure our loved ones are safe — having reliable heat in the home is a big part of this. If you’re one of the many households that rely on propane, regularly checking your fuel levels should be as important as locking the doors at night or making sure the stove is off before you leave for the day. Locate your propane tank. Large propane tanks can be installed either above or below ground, at least 10 feet away from the home and any other potential sources of ignition. An above ground tank should be easy to spot. To locate a buried tank, look for the small plastic dome that houses its valves and other components. Check the float gauge. Unlike a smaller canister, large propane tanks are equipped with an easy-to-read float gauge system. As the name implies, this system uses a floating element to determine the level of propane fuel in your tank. This is clearly indicated by a simple dial that shows you the approximate percentage of fuel left. Know when to refuel. Above ground propane tanks should not be filled beyond 80% of their capacity. Underground propane tanks should not exceed 85%. Most fuel suppliers recommend filling up when the float gauge indicates that the tank is around 20-30% of its capacity. However, many homeowners will choose to top off sooner than that, particularly when propane prices are at their seasonal low points. While a float gauge can give you a good idea of how much propane is left in your tank, it’s not 100% accurate. For this reason, we recommend always erring on the side of caution to avoid running out. Running out of fuel isn’t just a nuisance. It can also potentially introduce air into your heating system which can cause damage. Propane furnaces that have run out of fuel need to be restarted by a qualified professional. As you become more familiar with your home’s heating needs, you’ll be able to anticipate in advance when refilling is required. Many homeowners like to set themselves calendar reminders or place a note on the fridge so they don’t forget to perform periodic checks. Need a refill fast? 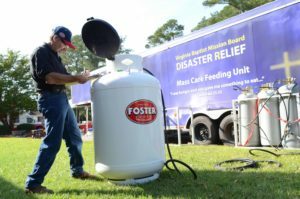 Foster Fuels can help. Give us a call to schedule service at your convenience. How long will a 20lb propane tank last powering a RV refrigerator? Good question. It really depends on how hot it is in the RV but a 20lb propane tank would last almost a week just running the refrigerator. If there is anything we can help you with, let us know! Thanks for mentioning that a propane gas delivery company can refill the tank if it isn’t in good condition. My parents have had a tank for over twenty years and I’m pretty sure it hasn’t been certified. I’m worried about them running out of gas, so it might be a good idea to sign them up for a delivery system. It’s nice to learn that if you have a large grill it would take around 10 hours for your propane tank to run out and it’s possible to gain the skill to recognize your grill’s fuel supply through hearing. That’s perfect to learn since I am having a large barbecue grill installed in our backyard for the summer pool parties that the kids will be having. I’ll just make sure to have a reliable propane gas delivery if available pass through our area. Thanks! It is a good idea for commercial building owners to understand the lifespan of propane tanks. I didn’t know that recertification was needed after 10 years. You want to be sure you can use the gas you have when you need it. Hey Sharon, it depends on a lot of different factors like how many propane appliance you have, how your tank is, your local weather, etc. If you have a few minutes, we would just need to ask a few questions about your situation to answer your question. We’re happy to help. Call us at 800-344-6457. I have a freshly filled 40lb tank of propane & a 10,000 BTU ventless wall heater im planning to use in my wood shop (16′ x 22′) as my primary heat source. Assuming i spent an average of 6 – 8 hours per week in the shop with the heater at lowest setting, approximately how long would my tank last? ** hoping the “heating/on time” will be less then i mentioned above (6 – 8 hours)due to building/shop being insulated. Possibly just turning heater on to knock the chill off. Thank you Jack for you question. There are many variants that have to be considered before giving you an adequate answer. Please feel free to reach out to one of our experts at 800-344-6457 or but visiting our Contact Us page. I didn’t know that propane had no odor or color. It’s nice that you mentioned that this type of gas can last for a very long time used and unused. My husband is considering looking into residential propane for some appliances on our property; thanks! It’s good to know how long propane can last. I had no idea that a good tank can last up to ten years! That’s a pretty good lifespan, I think. We want to start using propane in our home more, so thanks for this information.